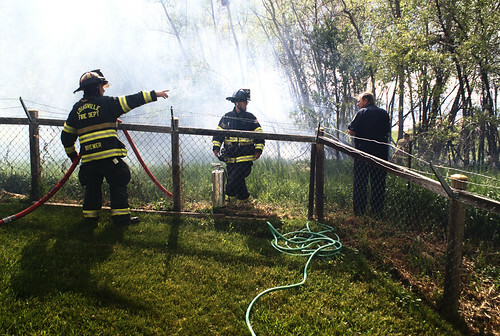 They ran into the house, panting, "Mr. and Mrs. P's house is on fire!" I leaped to my feet, grabbed my camera, and ran out of the house with them, not caring about my general state of dishevel. I go camping with my neighbors several times a year; they have seen me in my morning face as well as my tired-as-heck-give-me-another-drink look by nightfall, so I didn't particularly care. There was a fire in the hood! As I ran, I saw my neighbor John eyeing the first response truck, wondering what the kids had been up to this time. While we don't see these trucks in our 'hood very frequently, we have had them come out every so often - the weirdest one was to help an eight year old who had swallowed a rare Jamaican coin. She figured she wouldn't lose it if she held it in her mouth as she took a last jump on the tramp before they headed off on vacation. Needless to say, her first day of vacation was spent at The Children's Hospital in Denver. I apprised John of the situation as I ran past him, only to have him give the girls, who were close on my heels, something to giggle about for the next week. Expletives! Pretty much the same words that ran through my mind when the girls first burst into the house with the news. The rumble and flash, of thunder and lightning, were followed by a distant roar from across the San Luis Valley. The sound persisted and several campers likened it to that of a train, one that was approaching us slowly but surely. A tornado? At 8200ft? Unlikely but unsettling enough for my neighbor Lisa to quietly start gathering her chairs and other belongings as the wind picked up and brought the sound even closer. Soon there was an increased urgency in her movements and I followed suit, neither of us knowing what we were hedging against. It hit us before we knew what it was. We scrambled to our cars and campers, some to the closest tents. Within seconds, the ground was covered with the largest hail I have ever seen, some almost 2 inches big. Many of us had bruises for show-and-tell later. Others, like my husband, had a sore head from sticking it out of the car to try and catch some of that frozen wonder. 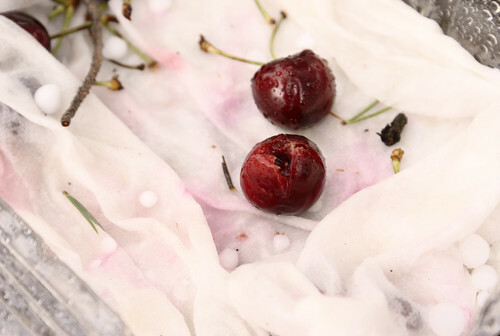 In my haste to get to our van, I forgot to pick up leftover cherries from our pit spitting competition. And because you want to know, I am the reigning champion of the pit spitting competition. My neighbors will vouch for me. Most of you know how lucky I feel about living where I do. The mountains are just an hour away, within sight every day. 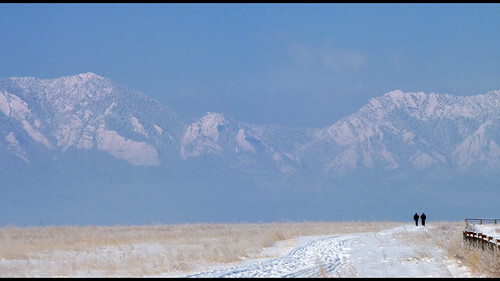 Sometimes we can't see beyond the Flatirons but when they can be as gorgeous as this, who cares? What am I doing posting pictures of winter? It may be spring for most of you but winter didn't really get over for us until a few weeks ago. 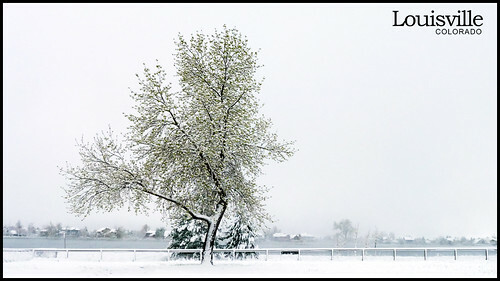 Four inches of snow on May 15 had several people feeling sorry for us. Colorado is something spectacular, even in the flats. We had radiant sunshine the very next day and were back up in the 70s by the weekend. Lazy folks like me are very grateful for any precipitation we get because that translates into "no need to turn on the sprinklers."